Baseball is an all American thing, the national sport and pastime. It is almost a cultural identity and its own epic is often burdened with American history in the background. Standing testimony to this is how a Japanese-American boy regains dignity and acceptance at the ballpark, post World War II. 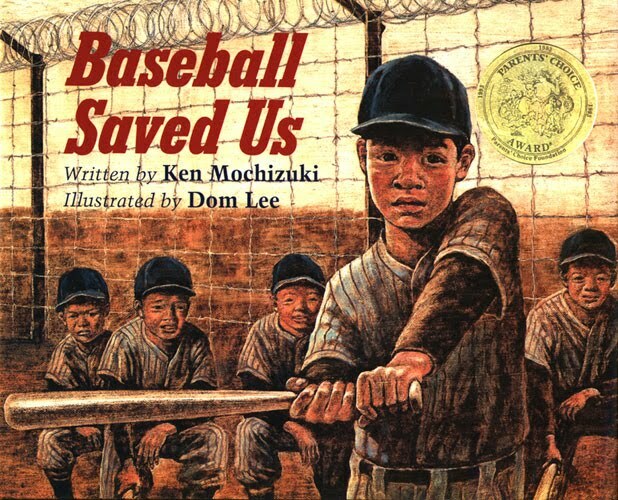 Written by Ken Mochizuki, whose parents were camp internees in Idaho during the world war, this book makes you cheer our little hero, while holding off that drop of tear that has already arrived. The voice is that of a Japanese boy, an American citizen who is pulled out of school one day by his mother. His family is sent with many more Japanese families to live in barracks in an internment camp established in the desert, in the middle of nowhere in 40s USA. A soldier with a gun stands on a tall tower at the camp monitoring the group every second, every day. With no basic amenities and no work to do, kids and adults idle around. There is pent up anger, frustration and boredom. This is when the boy’s father takes the initiative to come up with a baseball diamond. Soon, with collective and creative efforts (and no interference from the guard) many games are being played on that field encompassed by barbed wire fences and armed watchdogs. However, the boy’s track record at school, before camp, is not very impressive. Tarnished by experiences of name calling because of his smallish stature which was even more accentuated amidst American boys, he is diffident and shy at his game. He was Shorty back home. But now at camp, he does not feel different in the company of Japanese boys like him. With this feeling of normalcy and the motivation to impress the guard staring at his game all day, he buckles up and performs. Daily sessions then on hone his bat-ball skills. The war is over and he is back at school. But he feels worse. The boys don’t even talk to him now. This is when America had been at war with Japan, when the U.S Government seemed to suspect the loyalty of immigrants in the country and hate was running high. The Jap’s no good, Shorty, Easy out, the boys scream at him, when it is his turn to bat at the ballpark in school. He stares at the pitcher and sees the guard on the tower in him. A dramatic finish to the game and to the book is the last page showing the American boys in the winning team lifting Shorty up with pride and joy. 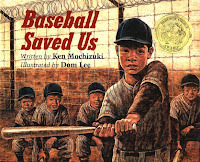 Baseball sure saved – helped his people survive the camp and helped him become a hero. The illustrations are in sepia, in tones of brown and black reemphasizing the depressing mood in the desert. The author has also restricted some of the darker details to a few sprinkles, without going overboard about wartime camps. While it can be hard for some of us and our children to directly relate to those times, the issues are still part of what every “different” child experiences under varying circumstances today - it boils down to the battle to fit in and to feel accepted. This book provoked questions about war in my six something year old. She could not fathom being uprooted and seemed very curious about ways in which normal life is disturbed when a country is at war. The story can also set the stage for sensitive and meaningful discussions about tolerance and oneness. It can also make children value the better times of today, that some of them enjoy. While critics might think that a home run might not be the answer to discrimination, it still works for a child’s understanding is my personal thinking. The deeper virtue might be courage; courage of the kind that the short Japanese boy who played America’s game amidst racist gibes had. This book inspires in more than one way. Picture Courtesy: Lee & Low Books. Your review of THE OTHER SIDE, helped me get started on books on racial discrimination. Who knows, may be this book will help me get started on WW and concentration camps. What a timely review with the SF Giants starting Game 1 of the World Series today! Using sports to raise a complex issue such as this is a wonderful way to get kids thinking....lovely! At the ST meet we had at Vibha's place, I remember having a conversation with Satish in which he lamented the lack of good books for children about sports. The only ones we could think of were Sandhya Rao's book on cricket and an Amelia Bedelia. I am so glad to find this review, Meera. Sounds like a wonderful book. Not just for sports, but also for all the reasons you have enumerated in the last para. Will certainly want to get this for the kid at home who sometimes feels discriminated against by her peers. As also for the WW2 junkie in me. Awesome pick Sathish. Will pick it up soon, thanks! @Sandhya: Matthew Christopher is the name to look out for - remember buying tons of his books once for a sports-crazy nephew. Sounds like a wholesome book, handling so many things through the narrative - different-ness, unsettled feeling, insecurity, feeling of getting uprooted, self-belief, grit and determination. I am sure a cricket lover at home would want to read this one. I am sure the kid is listening to my thoughts. Yesterday after shower, she said, "Amma tell me about World War." It was very surreal to me. One min she is in the water goofing around and licking soap the next min she is asking me about WW???! Apparently she read this in the school library. She still does not know about the holocaust. She thinks WW was primarily between US and Japan. So I will start her off with this book. I am extremely curious to know what happened out there in the field. I loved this review, and am going to look for this book. The Imp was introduced to the Wars after a stray reference to Hitler got us talking about the Holocaust. (She had also seen me weeping through a late night telecast of Schindler's List). We went on to read Barefoot Gen together which, apart from being anti - war is also a pretty powerful message about standing up for yourself and what you believe in.. something I find increasingly relevant to her as she struggles with snotty peer groups. Wonderful pick and a great review Meera ! Liked the way you have analysed and brought out the various issues addressed in this book. I think it will be a great book to read with my son, as the sports tag will definitely appeal to him and then I can discuss the other things too. @utbt: I distinctly remember that. She also seems curious and prepared for the book:) Try it and let me know. 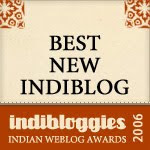 @ Sandhya, that's something I've been thinking a lot..will take it offline sometime. I've been gathering quite a few books in fact. @Tharini, Ranjani, Vibha and WJ: Please do try this book, for the sport, for the war or for peer-pressure issues. We enjoyed it and learnt from it. @Vibha, Chox(:) and Sriram: Thanks!!! sounds like more than just a sports book, very cleverly using sports, which would appeal to kids, to convey profound messages. Thank you, Meera for an excellent pick and an engaging review. Wonderful setting to highlight the desire to fit in . Picture books in the genre of historical fiction work very well, especially when you have to bring up a difficult topic in history with little ones. Pictures take over and do the talking. Wait till you see my upcoming pick today because it deals with another difficult topic! Seems like a very powerful one. Enjoyed the review.